The Beloved Bracelet is our best selling bracelet. This set of four bracelets for a grandmother of four is so simple yet meaningful. Mix the metals and stack them together! The price listed is for four bronze/bronze bracelets. If you change the metal combination the price will change. 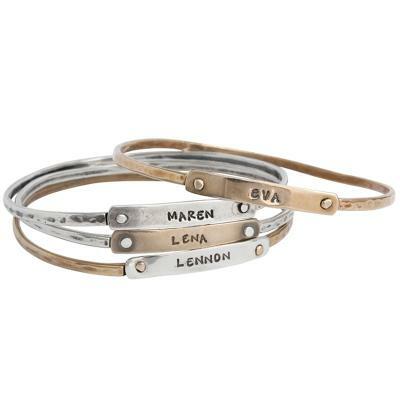 This set of four personalized grandmother's Beloved Bangle Bracelets is a simple way to show your love. We love the versatility of the metals ~ you can mix and match to create the perfect stack of bracelets. We offer four different metal combinations so you decide if you want to mix it up or match them all. Anything you decide will look great, and be meaningful to you! Personalized Stamps: grandchildren's names, birth dates, nick names, an anniversary date or an inspirational word. The price listed is for four bronze/bronze bracelets. If you change the metal combination the price will increase. The bracelets can be ordered in four different metal combinations. Please note, the letters on the bronze nameplates do not darken as much as on the silver nameplates. Because of the customization, you can only order one bracelet at a time. Dimensions: Large - Approx. 8.25" around. Small - Approx. 7.75" around. The cuff piece is approx 3mm wide and the stamped nameplate is approx. 1.25" x 1.25" and can be stamped with up to 11 characters/spaces. All bracelets are bangles and slide on the wrist. They do not have any type of release to open and close them. Need help with bracelet sizing? See the video below for sizing instructions. Because these bracelets are customized, all sales are final. All prices include stamping. Love my bracelets!! Ive been admiring these since my first grandchild was born and after having four and another on its way i decided to order them. I chose all 4 in the plain hammered design with lizzy font. Very delicate and simple, but eye catching sparkle. I've worn them everyday since i received them and have gotten many compliments! I don't normally splurge on myself, but so glad i did!